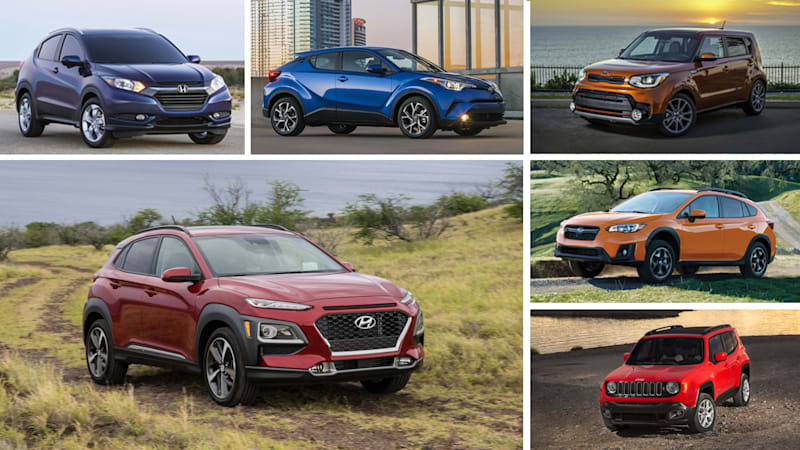 The 2018 Hyundai Kona is the hottest new thing in the hottest new segment: subcompact crossovers. Or B-segment SUVs. Or whatever you might want to call this hodge-podge collection of vehicles of vaguely similar specs. Each is pretty much just a raised hatchback in some form (or literally in the case of one entry), skewing the increasingly vague line between car and SUV. If there was ever a segment that deserved the term “crossover” for more reasons than just its car-based unibody architecture, this would be it. Immediately you can see how all over the map this segment is. True, all but the Jeep come with a standard naturally aspirated four-cylinder and fairly comparable horsepower. Torque differs, but not wildly so. Then things get nuts. Some are automatic only, the Toyota is CVT only, the Honda and Subaru come with a manual standard and offer a CVT as an option. The Renegade’s base engine is manual-only … in 2018. Of course, then things flip-flop with the Renegade’s upgrade being naturally aspirated and the Hyundai and Kia offering turbocharged mills. The Korean corporate cousins also come with automated manuals, whereas the Renegade has a box with nine gears selected by a lethargic monkey. Then there’s the drivetrain. The C-HR is front-drive only, which pretty much cements the Soul’s place in a segment it arguably created despite not offering all-wheel drive. That’s the only way to get the Crosstrek, while the Honda and Hyundai offer a typical option of a part-time system. In Jeep fashion, the Renegade’s “four-wheel drive” systems differ by trim level. If you envision your small SUV lifestyle involving getting the thing dirty, then the Renegade, and specifically its Trailhawk trim level, would be your best choice given its multiple terrain settings and 4WD Lock setting. Note, however, that if you’re really just interested in ground clearance, the Crosstrek matches the Trailhawk and betters every other trim (not to mention all the other low-riders on the sheet). As for fuel economy, the HR-V is tops in terms of base engine, but the Kona is right on its tail and we’re guessing it’s extra power will make a big difference compared to the doggedly slow little Honda. The fact that the Kona’s turbocharged engine upgrade matches the fuel economy of the base engine is certainly noteworthy. The Crosstrek is the biggest on the outside since it’s based on a C-segment car rather than a B-segment one (or, more accurately, is literally a Subaru Impreza with a lift). That translates into competitive space on the inside, though the Kia’s uniquely boxy proportions and the HR-V’s unique flipping-and-folding “Magic” back seat ultimately result in greater rear seat legroom. The Kona is the smallest here apart from the tiny cave that passes for the C-HR’s aft quarters. The Renegade is also quite squishy, but at least has top-hat-friendly headroom. The HR-V is the cargo space champ due, once again, to its Magic Seat. Like the Honda Fit, its gas tank is located under the front seat, allowing for the back seat to fold extremely low and completely into the load floor. The seat bottom also flips up for added versatility. Once again, the Kona is on the small side here, and is really on par with a typical compact hatchback. The C-HR is roughly on par with a Coleman cooler. Here, you can literally see how all over the map this segment is. Normally, we don’t include this info in these comparisons, but in this case, it was too interesting to leave out. The C-HR is built in Turkey. The HR-V in Mexico. The all-American Jeep is made in Italy of all places. And that’s not to mention the Chevy Trax built in South Korea or the new Ford EcoBoost built in India. No, not Indiana. That’s where the car with the super-Japanese brand name is assembled. Yep, India India. The Kona seems comparatively normal assembled in its corporate homeland of South Korea.